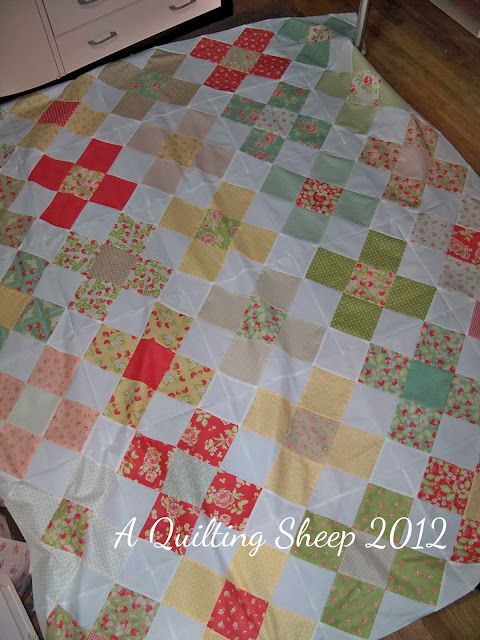 A Quilting Sheep: I really have been quiet! I really have been quiet! The Granny Squares blocks I made a while ago got put together into a flimsy. I used sweet Trish's (Notes of Sincerity) tutorial. I've been working on my Betsy's Closet stitchings. I am less than happy with how this block looks. Jenny of Elefantz shared some tips. 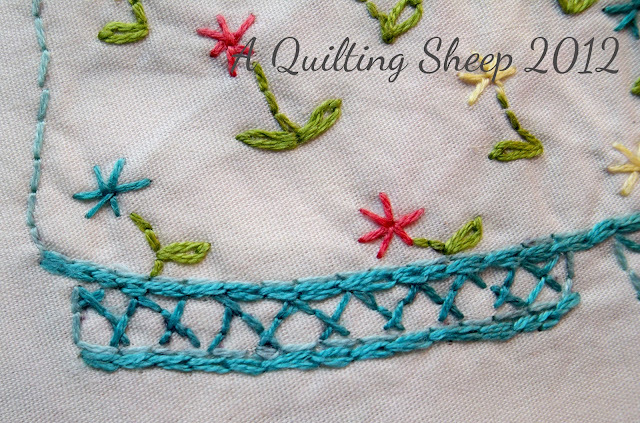 has greatly improved the quality of my stitching. Amazing what you can do when you can see! I may or may not redo the other block. I'll make that decision after all the blocks are finished. Have a great day, friends...I am thankful for all of you. Your granny square quilt looks fabulous and I love your baby quilt made with the extra blocks. I think everything looks very pretty. I saw your block on Betsy's Closet, and feel you should do what makes you happy, but I, as others thought it was beautiful. I need to email Jenny as I can not post. I do not wish to post on my blog until I can post on the stitch along. I made place mats with Trish's tutorial, which is great by the way. The Mr. saw yours and asked when mine will be done...hehehe. Love both of your flimsy's. Did you use blocks from the bigger one to make it smaller??? 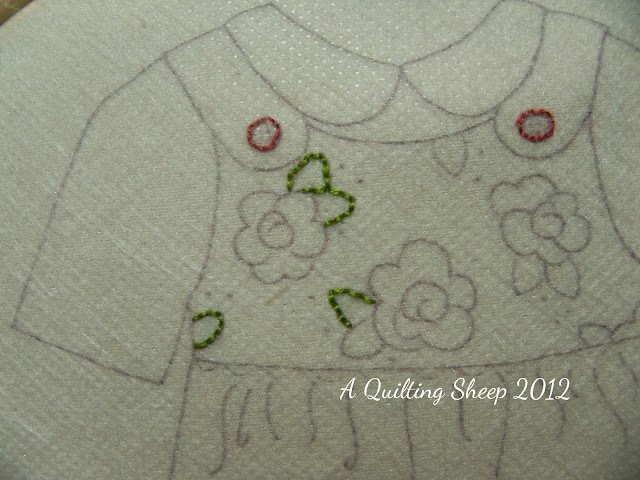 I love Fig Tree fabrics and the pattern is a good fit. I agree that the baby quilt just wasn't working. Wow your granny squares are amazing, love them! Don't blame you for ripping out the quilting, I do that too, almost every single quilt, lol. I never get it right the first time. 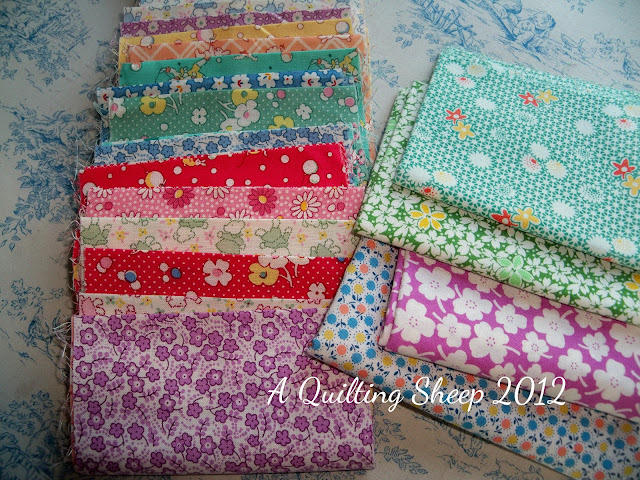 LOVE your 30's fabrics...I used to have a very large stash of them and USED THEM UP, lol!!! Never thought I would. Now I'm moving onto solids. Oh Amy I have such trouble seeing too, but can't use a magnifying glass. I just have to take off my glasses and put my stitching up to my nose. Not great posturing for my neck, but I take breaks. Your stitching looks great! Wow!! You sure get a lot done when you're quiet!!! Love the 30's fabrics!! Love Betsy's closet! I am waiting for my fabric to arrive before starting. 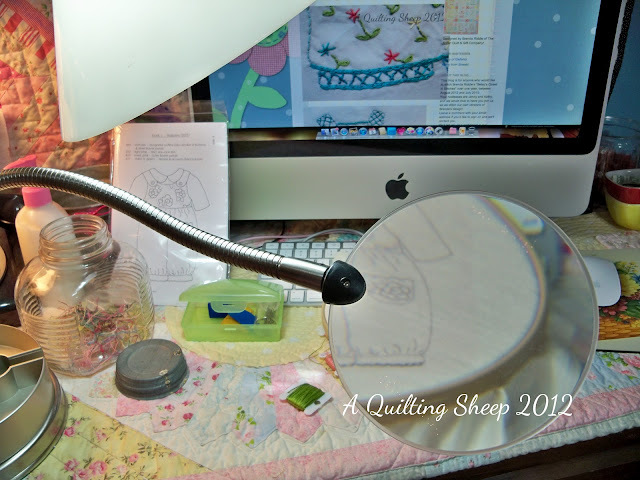 Magnifiers and I don't agree, so I use an LED lamp to make things clearer. Eye Doctor told me to go buy some cheater glasses for close up work. This will be my first back stitch project, always used the stem stitch before. Wish me luck! Cheater glasses are a good idea, too. If the magnifier doesn't work for me, I will check cheater glasses out. Thanks for the tip! Absolutely lovely, lovely things! And your piecing is so beautiful. 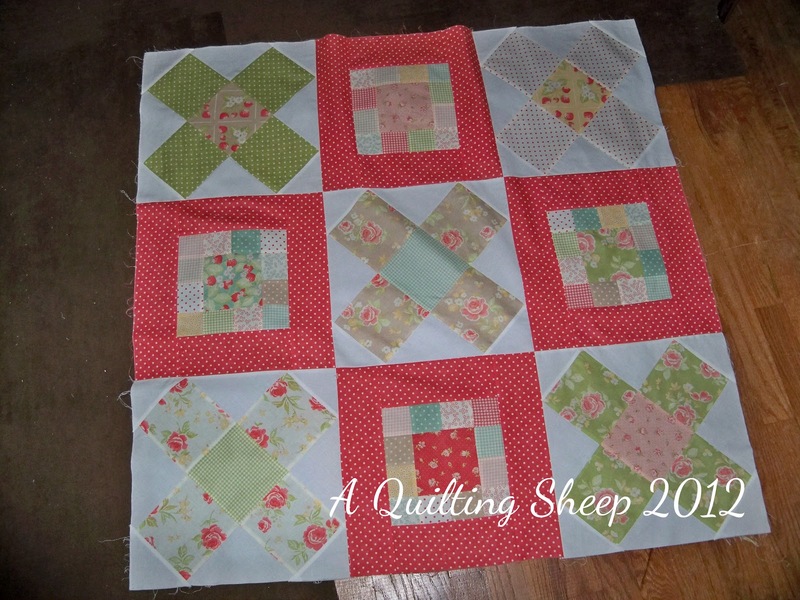 Please post as soon as that quilt gets quilted. I don't do hand work any more - my hands don't work (only with a machine). But I love to see what others do. Amy, when I embroider, I use DMC floss and only two strands (however, a fellow quilt store owner and excellent embroiderer and hand quilter , uses only one strand...you may want to try the "stem stitch" as it has a smooth, rope like appearance...also NEVER cut more than 12-16" of thread or floss to thread your needle with ...embroidery just takes alot of practice to learn what works best for you!! You've accomplished a lot, Amy! That is great! I'm the same way and have to be quiet sometimes and stay off the computer and actually DO something. LOL! I'm looking forward to seeing your granny squares quilted. Your quilts are lovely and going to make a lot of people very happy! Love how your granny quilt turned out. Oh your 30's fabric is so pretty. I love fabrics from the 30's. I think your stitching is fine. Those fabrics are so heartbreakingly cute! Time for Dots on Dots!